A new television service called Aereo will give viewers the opportunity to watch live broadcast television networks over the internet on devices like the iPad and laptop computers. 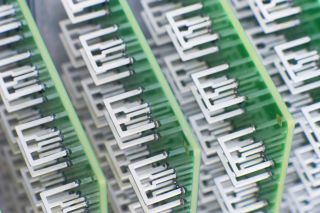 Aereo will begin a trial in the New York City area on March 14th and will allow live HD streaming of major networks including ABC, NBC, CBS, Fox, PBS, CW and a host of local channels. The $12 a month service aims to help people end dependence on expensive cable contracts and free network television from the 'closed circle' enforced by cable providers. It is able to legally stream the live TV over-the-air directly to your devices thanks to tiny thumbnail-sized antennas (one per user), which are stored together in a company data center. From there you can use the HTML5-designed Aereo.com website to view content on tablets, smartphones and even on the big screen with devices like the Apple TV and Roku set-top boxes. The service will also give users the opportunity to record 40-hours of shows from the TV guide with their own personal remote DVR that again doesn't require a set-top box or a cable subscription. The service is primarily aimed at the casual TV viewer who has no desire to pay over-the-odds for cable channels like HBO and ESPN and is happy with the network offerings. "If you have this and you have Netflix, you absolutely have the ability to not have a standard cable subscription," said Chet Kanojia, Aereo founder and CEO. So, instead of paying over $100 a month for a cable TV package, viewers will soon be able to take advantage of Netflix, Hulu Plus and Aereo for around $30 a month. One of the key backers Barry Diller told the New York Times: "Anyone will tell you, whether it's Amazon or Hulu or Apple, that they can't get enough programming that people want to see to – so to speak, 'break the chain' — because all of the programming is controlled within the circle. "[Aereo] pries over-the-air broadcast television out of that closed system," he added. New Yorkers can register their interest in the service at Aereo.com.